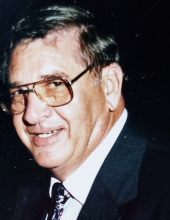 Donald George Graef age 85 previously of Lena passed away on January 31, 2019 at the Oconto falls Atrium. He was born to the late Philip and Ernestine Graef in Lena on June 30, 1933. He graduated from Lena High School in 1951. He married the love of his life Jean Carol (Van Dreel) May 2, 1953. He was employed at Unit Structures in Peshtigo until he was drafted into the Army in 1953. After serving his time in the Army he returned back to Lena to take over the family farm. He owned and operated a milk route for 12 years and he was a field representative for Frigo Cheese for over 18 years. He loved to travel with his wife and friends, they were fortunate enough to travel to all of the Continental United States and Canada. He had a passion for Polka Music and Polka dancing. He enjoyed fishing at his cabin on Lake Noquebay. He loved spending time with his grandchildren and great grandchildren. He is survived by his loving wife of 65 years Jean, 4 sons Gary, Dennis (Lori), Bruce and Tom (Laurie) Graef; 3 daughters Brenda (Jeff) Sellen, Mary Jo (Glen) Meyer and Jo Ann (Randy) Lierman. 19 grandchildren and 31 great grandchildren. 4 Sisters Marie Marquardt, Pat Perron, Margaret LeFebre, Jeanette (Larry) Dabb and many nieces and nephews. He was preceded in death by infant daughter Carol Graef, infant grandson Steven Graef. 3 Brothers Bernard, Philip and infant brother James Graef. One sister Claire Mae. The family would like to thank Heart Land Hospice, Oconto Falls Atrium and Meadow land Cottages for their loving care. The family will greet relatives and friends at the Rhodes Charapata Funeral Home in Lena on Monday February 4th from 4-7 PM the Wake Service will be at 7PM with Deacon Peter Gard officiating. The Visitation will continue again on Tuesday February 5th at St. Annes Church in Lena from 9-11AM the Service will be at 11Am with Father Joel Sember officiating. Donald will be laid to rest at the Pine Hill Cemetery in Spruce. To send flowers or a remembrance gift to the family of Donald George Graef, please visit our Tribute Store. "Email Address" would like to share the life celebration of Donald George Graef. Click on the "link" to go to share a favorite memory or leave a condolence message for the family.